As I have said before, I do not like the way DeWalt and Porter-Cable label their tools as 20V Max when their nominal voltage is actually 18 volts. You know there is something wrong when the press release includes an asterisk stating "Maximum initial battery voltage (measured without a workload) is 20 volts. Nominal voltage is 18.". Other than that, the tools look like good budget offerings. 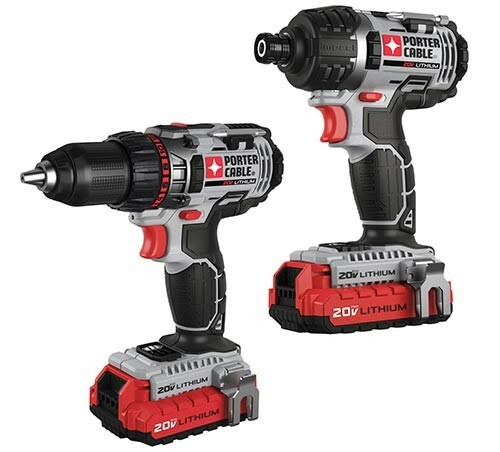 The model PCCK600LB cordless Drill/Driver packs in quite a few features that really make a drill easier to use, like, a ½-inch metal ratcheting chuck, onboard bit holders, LED work light, and a belt clip. A two-speed transmission delivers up to 400 RPM on low and up to 1,600 RPM on high. The PCCK640LB Impact Driver features a ¼-inch quick-change chuck and also shares some of the features from the drill, including, a belt hook, onboard bit storage, and work light. It delivers up to 1,450 inch-pounds of torque with a variable speed of 0-2,900 RPM and 0-3,100 BPM. Another feature that has been finding its way into more tools and is an onboard both models is battery fuel gauge. Porter-Cable also designed ergonomic handles on their new tools, and tried to keep the weight and the sizes down. Rubber bumpers have been placed on the sides of the tools to protect them from jobsite abuse and to protect your work surfaces. Because these are budget tools, both model include the smaller 1.5Ah batteries instead of the higher Ah batteries found in contractor grade tools.